It is not uncommon that one wants to be able to create and save images from an OpenGL application. This might be for promotional purposes, a WWW page, documentation, creating frames for an animation etc. This short note gives a simple example on how this can be done, making it elegant and suited to your own needs is left as an exercise. This example will write two stereo pairs if the application supports stereo buffers. This example writes the bytes out individually, with some loss of generality this could be greatly simplified with fwrite(). Writing single bytes can cope with formats that might reverse the colour components such as TARGA, it is also convenient to sometimes flip the image vertically. The last argument to glPixelStorei(GL_PACK_ALIGNMENT,1); can be changed to higher values for increased performance on some platforms. It does often put restriction on the window size, that is, the window must be an integer multiple of the value specified in glPixelStorei(). The above function should be called before the buffers are swapped. While this doesn't make much difference on most OpenGL implementations, strictly speaking the the back buffers are undefined after the swap. One restriction of the above method is that one is limited to screen resolution, how does one create a higher resolution image? One way to handle this is to render the scene N times (N = 4 in the following example), each time the viewport is set so as to capture the appropriate subimage. This example makes no attempt to stitch the images back together, the idea here is to present the technique, the details are left up to the reader. The local solution is to have a post processing tool that collages the images into the one 4x4 grid. The following outlines a method of distributing an OpenGL model across a number of computers each with their own OpenGL rendering card. The OpenGL model might be distributed using MPI from a controlling machine (that need not have OpenGL capabilities). Each of the slaves render a subset of the geometry and send their draw buffers and depth buffers back to the controlling machine. These images are combined according to the values in their depth buffers. While tremendous performance improvements (especially price performance) are being made in OpenGL cards, there will always be geometric models that bring the best card to it's knees. For example, a high performance card might be able to render 15 million triangular facets per second. For interactive rates of 20 frames per second this means that one can display geometry with 750,000 polygons, if one wishes to render in stereo that drops to models with 375,000 triangular polygons. While this might seem a large number of polygons for those in the virtual reality or games market, it is a relatively low polygon count for many scientific visualisation applications. As an example, the terrain model shown below of Mars contains over 11 million triangular polygons. A solution that follows the trends in cluster computing is to distribute the OpenGL rendering load among a number of machines. Fortunately, OpenGL maintains a depth buffer and this buffer is accessible to the programmer using glReadPixels(). The idea then is to split up the geometry making up the scene and distribute each piece to one OpenGL card, generally each card will be in a separate computer. Each card will then only need to render a subset of the geometry. For example, for a terrain model it is quite easy to split the polygons up evenly (the splitting of the geometry so that each OpenGL card is evenly loaded is not always trivial) so if there are N machines, each one only handles 1/N of the total number of polygons. Each OpenGL card then renders it's portion of the geometry and sends the image and depth buffer to be merged into the final image. The logic for this is straightforward, set a pixel in the final image to the pixel in the subimage which has the smallest depth value, ie: is closest to the camera. The model is made up of 3 parts, the first is the red core shown above. The next two pieces are shown below along with their corresponding depth buffers on the right. OpenGL maintains a depth buffer as long as glEnable(GL_DEPTH_TEST) has been called. This depth buffer gives the depth from the camera for each pixel in the draw buffer. Points at infinity are shown as white in this example, those parts of the object closer to the camera tend towards black. In other rendering applications the depth buffer is often called the z-buffer. This is the final image, the images on the left are combined depending on the values of the depth buffer. That is, any pixel in the final image comes from one of the three partial images depending on which one has the lowest depth value. For example, the pixels under the green cone that protrudes from the center to the right have lower depth values than the pixels in the same region under the magnetic field lines. The fundamental problem with this technique is bandwidth. Consider rendering a 800 x 600 RGB model at 20 frames per second. There are 3 bytes for each image pixel and 4 bytes for each depth buffer pixel. So to transmit an image/depthbuffer pair from one machine to another requires (3 + 4) * 800 * 600 bytes or just over 3MB. For interactive performance at 20 frames per second this requires a bandwidth of 60MB per second which is clearly more than the capabilities of all but the very highest performance networks. To make matters worse even higher bandwidth is required the more OpenGL cards participate in the rendering although bandwidth bottlenecks can be reduced by arranging the OpenGL cards/machines in a tree structure and combining the image/depthbuffer pairs as the image pieces move up the tree. References Sepia: Scalable 3D compositing using PCI Pamette. Laurent Moll, Alan Heinrich, Mark Shand. Compaq Computer Corporation, Systems Research Center, Palo Alto, California, USA. Photos of "the real thing"
Photos courtesy of Terrence Cooney, Nark O'Toole, Ella Bourke. This model is based upon the amphitheatre in the center of the ancient Roman city of Jerash a few kilometers outside Amman in Jordan. 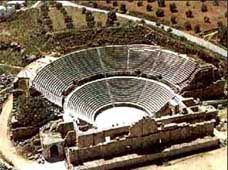 The theatre could seat around 4000 people and is similar in design to the amphitheatre in the center of Amman. The following discusses an attempt to translate an Architectural model from AutoCAD so that it can be explored interactively in OpenGL. The AutoCAD model was supplied courtesy of the Melbourne University School of Architecture and like many models of this kind it was designed solely for AutoCAD and not for interactive rendering. The geometry was exported "as is", the aim was to explore how far one could go with automatic measures. Two wire frame shots of the model are shown below. Note that there are a large number of facets, about 250,000. The vast majority were 3 vertex polygons, this is mostly due to the exporter for WRL files which was used to extract the geometry. One thing to notice is the large variation in density of the polygons. A large number of polygons are used around the decorative parts of the columns and archways. With the OpenGL card available for this work the refresh rate was only about one frame per second, half that for viewing in stereo. The question then is what can be done to improve the frame rate. Certainly the biggest gains could be made by creating the geometry appropriately, for this exercise the geometry was taken as given. In many cases this is the situation, the software that created the model might not be available or the expertise/desire to make changes to a complicated model might not exist. A obvious saving for environments that one mainly wishes to walk inside is to only render the geometry that is in front of the camera, or even better, within the view frustum. (Which of these is chosen usually depends on the number of items that need to be tested against the view frustum, if large then the simpler in-front/behind test is faster.) In this case one obviously doesn't want to compare each facet at each time step. One solution is to subdivide the geometry into pieces, form a display list for each one but only draw those that are visible from the current camera position. The images here show the model subdivision at various levels of splitting. For a particular model there is an optimal level at which subdivision should be taken, too much and the intersection tests and display list handling dominate, too few and the geometry in the largest display list determines the frame rate. How the subdivision is done is by no means trivial. A couple of schemes were tried for this exercise, the one finally used was to decide on a number of subdivisions and iteratively bisect the subdivision containing the largest number of polygons. This tends to form subdivisions with approximately equal numbers of polygons, for example it can be seen that there are smaller subdivisions around the columns than the seats. A better algorithm would be to base the centers of the subdivisions on the dense areas within the geometry. It should also be noted that while in this case the subdivisions didn't overlap, that restriction could be lifted for a more efficient partitioning scheme. As well as doing things efficiently in OpenGL, there are some standard checks and transformations of the geometry that should be made whenever transforming geometry from a CAD package into an environment where "every polygon counts". There are a number of inefficiencies that can arise with modelling in a package such as AutoCAD and exporting the geometry through an intermediate format. It isn't uncommon for there to be duplicate objects in a human generated model. A filter can be used to remove: all identical lines and facets; facets that are coplanar and lie within another larger facet. Turn two 3 vertex facets that share an edge into a single 4 vertex facet. This can be particularly important for packages that automatically split all facets into 3 vertex facets whether or not all the vertices are coplanar. It isn't uncommon for modelling packages to generate redundant facets, that is, facets where two vertices are coincident. The images shown here were created for a number of purposes: to illustrate the need for offaxis frustums for immersive environments, to test the movie playing performance of the recently released Matrox Parhelia 3 display cards, to demonstrate correct image creation and presentation at the CAEV (3 wall projection system at Melbourne University), and finally to test a more general camera specification in PovRay. All the images are 3072 by 768 and should therefore be a one to one match with projector pixels. All projections are based upon the screens being 2.4m wide and 1.8m high (4:3 ratio) with the side screens at an angle of 21 degrees (geometry of the test environment). It could be argued that the screens would be better angled at a greater angle than 21 degrees so as to bring the "sweet spot" (for 3 symmetric frustums, example 1) closer to the center of the room. This is commonly the projection used when the rendering software being used only supports symmetric frustums. This is the simplest render option, often chosen chosen because it's the easiest. Similar to (2) which can be applied to any position along the normal to the center screen. This is a good approximation to example 1 and can be performed in a single render. Unfortunately it only works for a single viewer position. This is an example of the most general case where all the frustums are asymmetric. An example of a typical viewer position for highly immersive applications. This isn't necessarily the common for front projection since a viewer position this close is likely to block the light from a front projection arrangement. Those that give undistorted views are indicated but they only give undistorted views if the viewer stands in the right place. Distorted projections are: 2, 3, and 4. Correct views can be created from any position in the room requiring one or more off axis frustums. I claim that the errors in the incorrect projection examples are most noticeable in animated (camera or object) content. All images have been created using PovRay and custom offaxis frustum code. This document describes an approach to presenting 3 dimensional environments on multiple screens (projected onto large walls). The key challenges for this project included the following. The content must be interactive, typically around 30 frames per second. Independent computers will be used to drive each display. Relatively low cost Linux machines with consumer grade OpenGL hardware will be used. The displays must be "perfectly" synchronised, it isn't acceptable to have noticeable delays between the content on each display. The orientation of the displays must be very general, coping with any number of displays, different angles and orientations. The hardware setup for this experiment was minimal, standard Linux (Intel based) boxes with GeForce OpenGL cards and 100MBit networking (10MBit was also shown to be satisfactory for the small communication volumes needed). While most testing was performed simply using three monitors placed in the right orientation, the system was operated in a couple of 2 and 3 wall installations with projectors creating a seamless wide angle image. In order to ensure that the displays on each computer updated exactly in sync, a simple socket library was written using sock streams over TCPIP. (All the machine were on a 100MBit network). Note that even if all the computers were identical and updating as fast as they could, they wouldn't stay in synchronisation. The main source of variation occurs when the geometry complexity in one view is much greater than the other views. Since OpenGL does frustum culling, the complex views will render more slowly. The software was written with one machine acting as the server and all the others clients. The same binary served as both client and server. A few messages were defined that were exchanged between the clients and server, these could be extended for more complicated environments, for example, where the geometry was changing. The messages are briefly explained below. Change the view position to (x,y,z). Server -> client. Change the view direction vector. Server -> client. Draw geometry to the back buffer. Server -> client. Swap buffers, back buffer to front buffer. Server -> client. A way to pass general flags to the clients from menus chosen on the server. For example, rendering mode, models choice, wall configuration, etc. The user chooses to quite while operating the server, quit is a menu item. Server -> client. So, the general flow is as follows. Whenever the user (controlling the server) chooses a menu item, that information is sent to the clients with the "flags" message. As the user drags the mouse controlling the camera position and orientation, the "vp" and "vd" messages are sent to the clients. Every 30ms the server tries to refresh its display, it sends the "update" message to each client and draws the geometry to its own back buffer. The server then waits for "ready" messages from each client, when everyone is ready the server sends a "swap" message at which point an essentially instantaneous buffer swap is performed on all machines. Strict performance tests haven't been performed because they rely on so many factors (scene complexity and type, OpenGL hardware, machine characteristics,....). For the particular configuration being used here, for a scene with sufficient geometry that could only just render at 30fps on a single machine, introducing 3 synced machines incurred a penalty of less than 2fps. While no testing has yet been done on the performance/scaling for very large numbers of walls, there was no further loss of frame rate for 5 walls. It is of course not necessary for all the machines in the "pool" to be of identical performance, the end performance (frame rate) will of course be limited by the slowest OpenGL hardware in the machine pool. OpenGL is especially suited to this type of projection because it has a very general frustum functionality (glFrustum()) which allows one to create the so called "off-axis" projections needed. The standard perspective projection offered by most rendering engines is unsuitable because it assume the view position is along a line that is both normal to and passes through the center of the projection plane. The wall specification is totally general. So while all the example above show a 3 wall environment where all the walls are in line, in practice the tests were mostly performed on 3 walls where the two side walls are toed in by about 30 degrees. Another arrangement is shown below where the walls are arranged vertically. Another application for 2 synced machines is in passive stereographics where one machine handles the left eye and the other machine the right eye. This functionality was also used in the testing as well as a 5 wall environment. The walls are specified by their centroid, normal, and up vector. These are all defined in real world coordinates, that is, one can measure a particular configuration directly and enter those parameters into the software as is. In addition the user position or in the case of an audience the "sweet spot" is also required, again in real world coordinates. While this is a very convenient coordinate system for defining the walls, it does require that the geometry being displayed is scaled to an appropriate size. A variation of the above has been implemented for machines playing precomputed movies. The obvious application for this is playing a precomputed movie in stereo. In this case there is only one wall but two cameras. The exploratory exercise above only dealt with very simple camera flying controls (position and orientation). Other camera attributes can be trivially controlled by adding further message types. Control over the geometry is also straightforward, as the user modifies objects on the server, messages need to be sent to the clients so they can reflect those changes. This also applies to time varying geometry, eg: traffic lights, planetary motion, moving characters, etc. There are some other operations that may not be trivial, for example, creating new geometry where the data transfer volumes may become more significant.